Yesterday I crashed Steve Brookfield’s keynote address at the Transformative Learning Conference. I couldn’t attend the whole conference because I had too many teaching commitments on my own campus, but I couldn’t miss Brookfield. I’ve been working with his methods for ages–personally, collaboratively, locally, and even cross-institutional-longitudinally. I’m a critical reflection geek. I didn’t expect him to dip into the topic of team teaching, and I was so glad he did. During the talk he invited the audience to use TodaysMeet (an anonymous back channel communication site) to record our reactions and questions and someone immediately responded: “team teaching is expensive.” I’m sure it’s what a lot of us were thinking, probably because a lot of us love to do it and have had to get really creative to make it a viable option. He said for him it boiled down to giving students the opportunity to observe critical dialogue in action: two experts with different perspectives exchanging views on a topic. In that regard, team teaching doesn’t have to necessarily be two faculty co-teaching all semester long. It could [more] simply involve a mutual agreement to visit one another’s classes, perform a critical dialogue, and include time for Q&A with students. Of course, full-blown teaching involves much more than that. But what struck me was how rarely it happens even within a team-taught course. So often when faculty team teach they collaborate behind the scenes intensively but then take turns facilitating class or even just lecturing to class. I had to dig into my own memories of team teaching and think about how often my co-teacher and I truly carved out time to perform critical dialogue as Brookfield described. Not enough. At least not much as a planned event–and this most likely because I tend to not want to “perform” to students, I want dialogue to arise organically with me and with visitors to class. But Brookfield made a good argument, and he used the term “perform” quite deliberately. He said this kind of critical dialogue often becomes rather dramatic, even theatrical, and in a good way. When a student-centered pedagogy guru promotes this sort of front-of-the-classroom performance I think it’s worth seriously considering. So I tried it a few hours later. It was fairly spontaneous, actually. A colleague and I serve as our institution’s Learning Commons Faculty Fellows. Our responsibilities include mentoring the peer educators in our Learning Enhancement Center–she covers Math, I cover Writing, but we both integrate broader issues such as intercultural communication, learning styles, and so on. Her discipline is Education; mine is English. Yesterday we coincidentally prepared discussions involving the pros and cons of asking students to think aloud as part of a tutorial. My discussion was focusing on second-language learners of English, hers was focusing on students with learning differences. So I asked if we could take some time to talk through our disciplinary perspectives on think-aloud protocols and practices, to briefly replicate the sort of critical dialogue Brookfield recommended. We didn’t get theatrical but it was exciting for us and seemed to be a nice change in format for the peer educators. And I used some of my colleagues’ insights to modify a think aloud lesson I’d just posted to our course site. I’d like to try it again but also to find more ways to give the peer educators the opportunity to engage in critical dialogues that draw upon their disciplinary and lived experience. I know sometimes, especially this late in the semester, they can feel relieved to have us perform so that they can just listen and respond. But I think once they got started they would be energized by the alleged drama of exchanging counterpoints on such topics as math and writing pedagogy. Organizing critical dialogue performances doesn’t make team teaching less expensive, but it does give us an inroad to reflecting on when, exactly, it might be the most beneficial to have two faculty (or two experts from any profession or life experience) teaching in the same room, and in what ways. This topic is also coming up as I work on an essay about participatory media. My writing partner and I are discussing the core concepts of story-work for a volume on digital storytelling in higher education and I’m increasingly mindful that the kind of learning experience we try to foster as co-facilitators of digital storytelling workshops depends on a teaching model that is “expensive” to replicate in the college classroom. There are at least three main ways that expert co-facilitators can make a big difference in a digital storytelling workshop: (1) increasing the diversity of connection between facilitators and participants (which enables the facilitators to tailor the experience more sensitively, sometimes in ways that can ensure participants feel more safe and more meaningfully heard, as well as more productive and better guided overall); (2) more skillfully managing the invention process–during story circles and individually (helping participants identify, reflect upon, develop, distill, and complete a narrative that makes best use of the constraints of the genre); (3) supporting the hands-on making and public sharing of the completed project in a way that is successful to the participant. When the workshop is conducted as part of an academic course or assignment sequence, there will most likely be just one facilitator–the instructor of record–perhaps assisted by a student or staff member with some experience of storywork and/or relevant technical expertise. These kinds of help are valuable, but not a real substitute for the level and degree of attentiveness an experienced co-facilitator can provide. Most of us doing this kind of teaching in college classrooms–or at least those of us who love it and include it repeatedly in our classes–believe it’s worth the effort even if we are unable to co-facilitate with a peer. We deputize current students, enlist help from volunteers, and so on, often with meaningful and even serendipitous benefits. But in FTE parlance (i.e., faculty workload), it is an “expensive” way to teach. 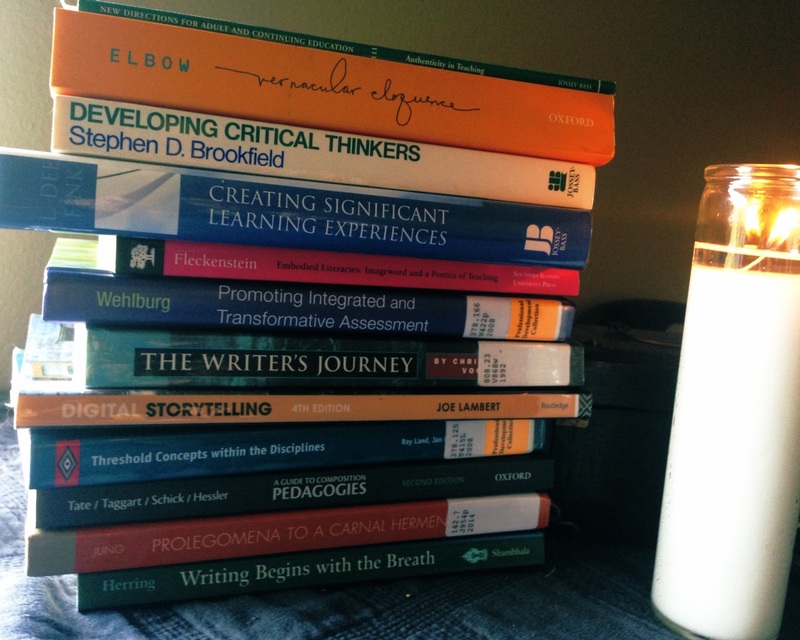 In my own pedagogy, I continue to experiment with ways to front-load or rearrange the process to figure out how I can reconfigure the workshop experience–by, say, making the media-production process more of a team-based learning session and the story-invention process a Bruffee-esque collaboration of knowledgeable peers. But while each experiment teaches me something new about classroom-based facilitation, I’d still always much prefer an expert co-facilitator, not for the big things that you might expect–not for the formal pedagogy or the writing conferences (though those matter a good deal)–but most of all for those subtle, in-between moments where I catch a skilled colleague smiling with a student, sharing a back story that informed the thing on the screen; catching the non-verbal cue of an anxious participant; saying something that needed to be said. When this happens it can make a world of difference in ways we may never fully know but can’t afford to miss. Last week I had a horrible teaching experience, then a wonderful one. A colleague is making a documentary film about liberal arts professors, and the film crew came to record my brilliant transformative teaching–I dressed in blue, had a smart interactive class planned as a lively debriefing about the arts-integrated field excursion my students had just completed. And as the cameras rolled various factors conspired to make the whole class period an awkward mess–and not in a good way 😉 I felt awful and embarrassed, and beat myself up afterwards but still had to walk over to the library to meet the film crew again for some additional footage, doing yoga with a former student to re-enact a funny memory from a year ago when we did spontaneous headstands in the classroom, and she reminded me why this work makes my heart sing, and that made everything nearly OK.
Here’s the thing: teaching is a humbling experience no matter how good you try to be, no matter how great your students may be, no matter what Period. And I tack on greater degrees of difficulty because I’m constantly integrating new community partnerships, new projects, new methods. When Palmer wrote that introduction he was entering his third decade of teaching. He’d been teaching 20 years. I began teaching college as a graduate student in 1996. I’m at the same moment in my career as Palmer was, seeking, as he did, to clarify my identity and integrity as a teacher, and to help my colleagues do the same. About 2 years ago I began a process of attempting to start over, with beginner’s mind, the path of learning my teaching self. I enrolled in yoga teacher training. My purpose for doing so was in some ways straightforward, in others not. My practical motivation was that I was already informally teaching yoga in some of my writing workshops–we would do moving meditations and “yoga for writers” activities, but I wasn’t formally trained and knew I ought to be. Around this time a couple of friends were diagnosed with serious illnesses and I wanted to understand how therapeutic yoga could help them prepare for and recover from surgeries and after-effects. I was also still very much interested in how digital ways of knowing intersected with embodied ones and an immersion in asana and anatomy seemed like an interesting new way to get at that. Ultimately, though, my motivation was more selfish and less intellectual. Deep down, I just wanted to get out of my head. During weekend intensives each month I spent 20 hours in a yoga studio learning to be a teacher. But I was really learning to be a student again. One of the tangles of teaching is that it even though our best practices remind us to focus on the learning, on the students, teaching is still largely about us. We enter the room hoping to share knowledge that we believe matters so much that we’ve invested most of our lives into learning and sharing it, and we have selected subjects and activities that we believe are most crucial for students to engage–quite possibly because they have sparked our our own hearts and minds so brightly. We want to give students the experience of our subject they can best or only get, uniquely, through us. (Otherwise, why not just log on to a MOOC?) If you think a lot about all this (and many of us do) you can find yourself trying so hard to be a great teacher that you lose your grip on the fundamentals of being a good one. Fortunately, there is almost always another chance to do better–another class period, another semester. But this means there is also always another chance, a likelihood even, that you will flop again. Palmer’s book became a classic, I think, because his awareness of the vulnerable, personally invested “self who is teaching” is so honest and true. He challenges us to be, as Florida Scott-Maxwell put it, “fierce with reality”–to own who we are and where we’ve been and why we are still here doing this work (29). I sit on the mat, nearing the end of my formal training [for now], grateful for that chance to begin again, from scratch, learning to be a teacher. Being a novice is frustrating. I haven’t yet memorized all the Sanskrit terminology or anatomy lessons; I stumble over ways to tell people where to put their feet; I take too long observing the students’ physical alignments before transitioning them into the next pose. But here’s what I know: this is nothing compared to what all there is to know, and yet it is really important stuff. It is fundamental. And when I return to my academic classroom, the teaching of yoga is reminding me to notice again, as if for the first time, where my students “feet” need to be in order to feel grounded enough to move from one task to the next. It is reminding me to notice where mine are as well.